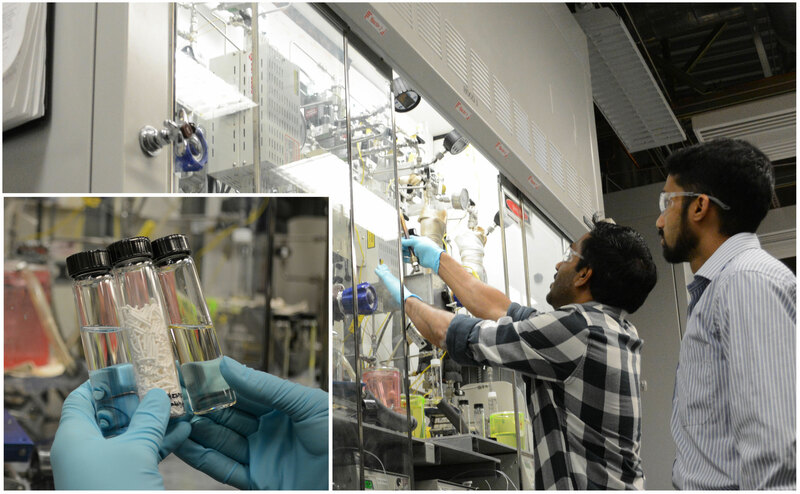 PNNL researchers Karthi Ramasamy (left) and Arun Devaraj investigate how zeolite catalysts suffer wear and tear while aiding chemical reactions. Enlarge Image. Catalysts known as zeolites are vital to fuel production and other processes. Coke deposits in zeolites are a costly problem in petroleum refinement and in petrochemical production. "Understanding coke molecules in zeolites will provide broad benefits across the refinery and renewable energy industries, and zeolite is one of the most highly utilized catalysts," said Karthikeyan Ramasamy, a chemical engineer at Pacific Northwest National Laboratory (PNNL). To explore ways to fix the issue, Ramasamy and other researchers from PNNL, with help from Lawrence Berkeley National Laboratory (LBNL), zoomed in at the highest resolution yet on these problematic carbon-based deposits. Results: They found zeolites's porous nature makes it a great chemical catalyst, but also traps tiny clusters of carbon-containing molecules that can ultimately disrupt the catalysis process. An uneven distribution of aluminum in the fresh zeolite catalyst causes an uneven distribution of coke deposits during chemical reactions. Methods: "We wanted to understand this coking mechanism and where it blocks the reaction and how it blocks it. By using a combination of techniques we could compare them to one another and form a complete story," said PNNL materials scientist Arun Devaraj, who co-led the study with Ramasamy. Detailed in the Nov. 23 edition of Scientific Reports, their study provides new insight about coke formation, both inside and on the surface of the catalyst, that could aid researchers in designing new catalysts or otherwise changing the chemical components and parameters to improve catalyst performance. What's Next? The team is analyzing the performance of even more efficient catalysts used to convert biomass to high value fuels to understand their disruption mechanism and how the catalyst synthesis affects its efficiency and selectivity for the conversion reaction. Read more in Lawrence Berkeley National Laboratory's news release. Sponsors: This work was supported by DOE’s Bioenergy Technology Office and the. Materials Synthesis and Simulation Across Scales and Chemical Imaging Initiatives, both conducted under the Laboratory Directed Research & Development Program at PNNL. Facilities: Some of the work was performed at two Department of Energy (DOE) Office of Science User Facilities—EMSL, the Environmental Molecular Sciences Laboratory on the PNNL campus and the Advanced Light Source at LBNL. Research Team: Arun Devaraj, Vijayakumar Murugesan, Jie Bao, Mond Guo, Miroslaw Derewinski, Zhijie Xu, Michel Gray, Sebastian Prodinger, and Karthikeyan K. Ramasamy, all PNNL. In 120 characters: Researchers zoomed in on vital fuel production catalysts, which could benefit refinery and renewable energy industries. In one sentence: PNNL and Lawrence Berkeley National Laboratory (LBNL) researchers, zoomed in at the highest resolution yet on these problematic carbon-based deposits, which are vital to fuel production and other processes.